Note: this webpage describes the fully fledged SODERA variant. Pls. check with us which variant is suitable for you and which features it includes. 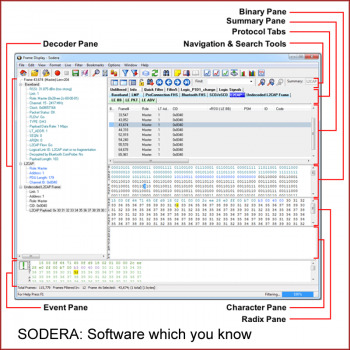 SODERA Protocol Analyzer makes use of software-defined radio technology to allow you to capture and see all continuous Bluetooth traffic on all its channels. You see all packets as they happen in the air! 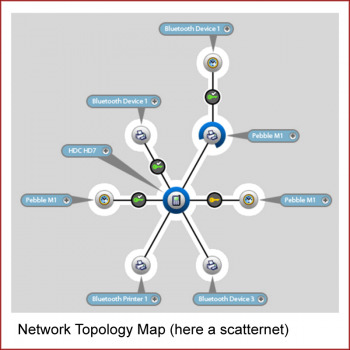 Regardless of the number and type of Bluetooth devices, node topologies, types of technologies, roles and protocols. SODERA's radio tuner captures the whole 2.4 GHz ISM band of Bluetooth traffic. A true wideband receiver, tuned and configured according to Bluetooth baseband specifications. 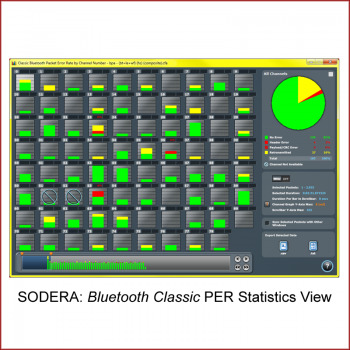 SODERA intercepts independently and concurrently all 79 Bluetooth Classic channels as well as all 40 Bluetooth Low Energy channels. You may record and view even all traffic which happens already before the Bluetooth connections are established, see the inquiry and paging packets of Bluetooth Classic states. Similarly, you can follow all advertisement packets and extended advertisement of Bluetooth Low Energy. In summary, SODERA captures, records, analyzes and presents all Bluetooth BR/EDR/LE packets in its range. 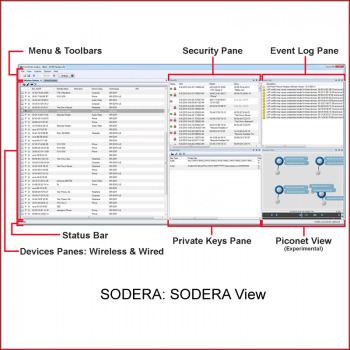 SODERA analyzer lets pair and bond the devices and run the whole communication sessions of the tested device(s) in the exact same manner as when no sniffer is present, it allows having no regard for its own measurement in the background. The developer may enter the relevant decryption key data even when the capture stage is finished and the traffic is already captured. It enables the developer to choose the best way and the proper moment to explore the decryption data from his device under test and to hand them over to SODERA. Say goodbye to often artificial measuring scenarios which required to enter the encryption keys in advance of the measurement or which stressed the developer to resign to watch and to test some kinds of encrypted sessions. Make your products more secure. 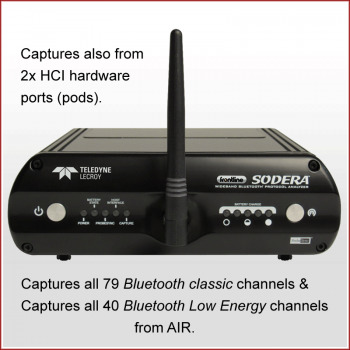 In addition to a capture of Bluetooth data transmitted over-the-air, SODERA also may perform simultaneous interception of the Host to Controller Interface (HCI). HCI is present in many Bluetooth devices. Concurrent captures allow correlating HCI commands and data with the Bluetooth packets in the air. 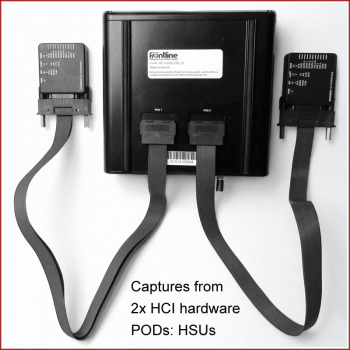 SODERA provides up to two HCI ports and connects to both used forms of HCI: a high-speed serial UART or USB interface. 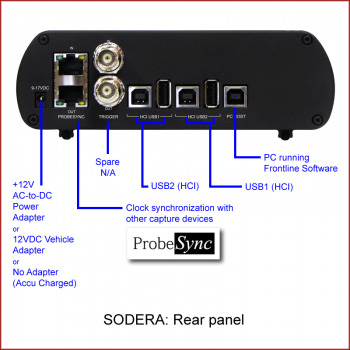 Instead of or beside the HCI recording SODERA can tap up to two digital signal wires per its hardware port, ie. up to four digital signal wires. 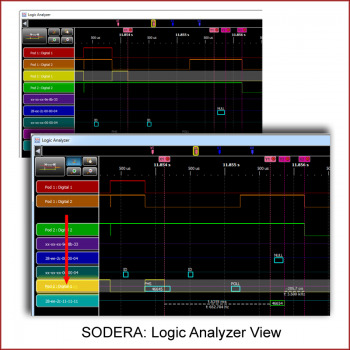 The course of record is available not only in the Frame Display window but particularly in the new SODERA's Logic Analyzer view. The latter allows comprehensive look plus an easy and fast user control to check the correlation of the digital signal changes with Bluetooth over-the-air sent packets as well as precise timing measurements between these events. SODERA contains a user-replaceable and intelligently rechargeable battery. 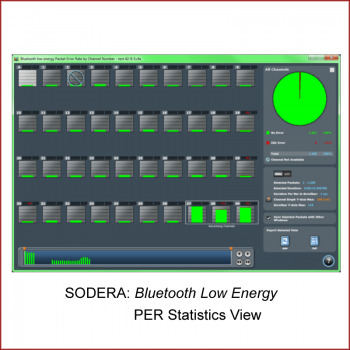 SODERA is capable of capturing at least one hour of Bluetooth traffic charged only by this battery. It does not need any measuring PC to be connected either. 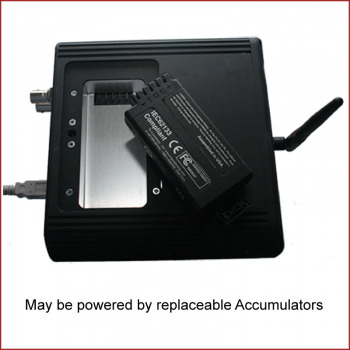 Alternatively, SODERA is charged by the vehicle power adapter (optional) or normal power charger and the battery only secures the continuous power to overcome any voltage fluctuation or outages, such as those which happen during vehicle’s motor start-ups or stops. Frontline software for SODERA provides all traditional protocol analysis features and capabilities which allowed the engineers and developers to develop Bluetooth devices and software with the assistance of Frontline analyzers for more than 15+ years. 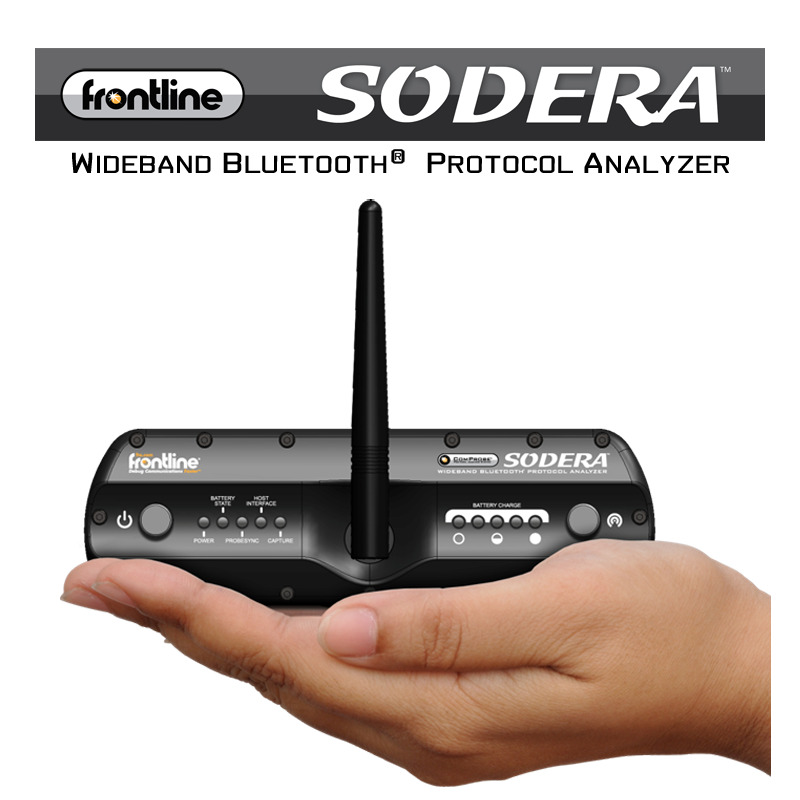 Besides SODERA’s capture and decryption capabilities that are superior to all former analyzer models and besides the full support of Bluetooth 5 decodes, Frontline software also incorporates new software features as SODERA View or Spectrum analysis, which are unique just for SODERA analyzer. 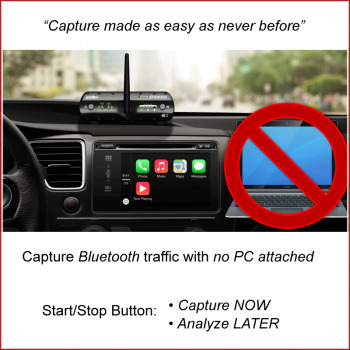 On top of that Frontline has developed the optional add-on software modules which comprise the knowledge commonly mastered only by human experts in the Bluetooth technology area. Their capabilities cover the complex relations of Bluetooth protocols, which normally require overseeing and understanding of multiple data packets and protocol events. Using these Expert System modules, the novice becomes nearly the expert and the real expert may work essentially faster. They help to discover the root cause. There is one module dealing with more general Bluetooth protocol issues and another one focused on the development of audio transmissions. They can be used together too. The first Bluetooth Protocol Expert System provides the concise in-depth analysis of configuration, Bluetooth profile errors, and HCI or transport issues. Two additional test tools are included too. LE Jammer tool allows transmitting of the additional LE traffic, emulating more load in 2.4 GHz ISM band. It allows developing more robust products. A2DP Sink tool makes SODERA a user-controllable sink device. This direct measurement provides a much more precise evaluation of the source device’s quality and Bluetooth audio score. The latter Bluetooth Audio Expert System finds all audio relevant Bluetooth packets and assemblies both the codec’s level and the audio signal shape from them. It provides the real-time visualization and play of the reconstructed audio signal together with the three types of events relevant to each level. The expertise rules of the module then evaluate the correlation of all recognized protocol, codec, and audio events and pinpoint the moments of possible audio errors. It enables the user to clearly see and precisely understand what happens from the audio point of view, especially at the moments when audio problems occur. Each point of the record is synchronized to the original Bluetooth packet stream in order to check the precise content of every related Bluetooth packet. The module may utilize both the general unreferenced and specific referenced sound mode. The latter compares the detected sound with the expected one and may quickly note any differences. All features make the root cause diagnostic of audio issues essentially faster and easier. It allows developing the product with higher audio qualities and reliability. Bluetooth 5 specification steps out from Bluetooth as a personal area network towards the Internet of Things concept. This is emphasized especially by such new features as Long Range. SODERA not only supports all Bluetooth 5 features, but its software defined radio architecture leaves it open to upcoming amendments and revisions. Nowadays SODERA already supports the present form of CSRMesh and Bluetooth Mesh technology. Both are work in progress and are expected to be developed further. The analysis of 802.11 (Wi-Fi) and Bluetooth data packets in perfect mutual time alignment is quite a difficult task. It is essential to capture the precise timing, frequency, size, and content of all packets in order to successfully develop, test and debug the devices which use both technologies, or which utilize the +HS option of Bluetooth specification. Frontline 802.11 is an optional analyzer by Frontline which has been developed for this purpose. When combined together with SODERA, using the ProbeSyncTM to synchronize the hardware clocks of both analyzers, developers may clearly see both 802.11 packets and Bluetooth 4.0 or 5 +HS packets together in one coexistence view. 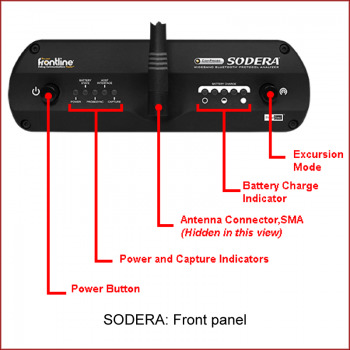 SODERA captures not only the Bluetooth packets from the air, but it also may record the 2.4 GHz band spectrum samples as they are present at the SODERA antenna. The Coexistence View then displays the intercepted spectrum power levels (power heats) synchronized to the view of the captured Bluetooth packets. The heat map allows seeing the present occupancy of the 2.4 GHz ISM band time slots and frequencies by other transmitting technologies. It also shows the occurrence of any other RF interference. The depicted shapes may often help to discover or identify their potential sources or their nature. The modern Bluetooth technology (both Classic and LE) automatically avoids the channels where Bluetooth packets would regularly collide. This adaptive behavior ensures that Bluetooth is more noise tolerant than other techniques, it transmits even when the 2.4 GHz band is seriously filled with noise. The spectrum analysis may show and prove what conditions of the ISM band are yet bearable to maintain the communication of the developed Bluetooth devices. The developer may also correlate the symptoms which his Bluetooth devices experience to the different conditions of ISM band.